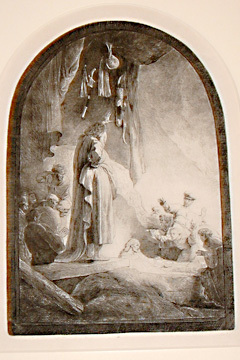 The image depicts the raising of Lazarus. Although new to Hawaii, Gary Ostrander is already acting like a kamaaina. He didn't come empty-handed to his new job as vice chancellor for research and graduate education at the University of Hawaii at Manoa, bringing with him a rare gift: an exhibition of 30 original Rembrandt etchings. Also: Aaron Young, president of Aaron Fine Arts of Baltimore, will speak about the exhibited works at 11:30 a.m. Tuesday in the Hamilton Library addition's Eugene Yap Room (Phase III), and 7 p.m. Tuesday in the Art Building Auditorium. The free exhibition opens at Hamilton Library today. The works are in the private collection of Baltimore cardiologist Dr. Morton Mower and his wife, Tobia, and were previously on view at Mower's alma mater, Johns Hopkins University. "Part of what (Ostrander) wanted to do when he arrived was show the community and faculty that he's as committed to graduate students in the arts, as well as science and technology that get all the attention," said Dana Myers, director of development for the UH libraries. "It's his gift coming in." "This is an exceptional opportunity for art students and faculty and for people in the community to enjoy an extraordinary collection of true masterworks," said UH Art Gallery Director Tom Klobe. 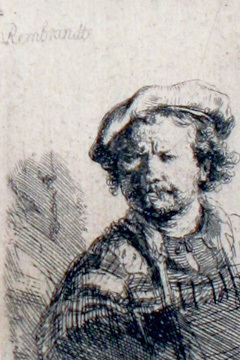 The etchings reveal the breadth of Rembrandt van Rijn's 17th-century subjects, from portraits and landscapes to historical and biblical narratives. The Dutch master was one of the first great exponents of the art form, a less demanding substitute for copper engraving. Rembrandt took advantage of the medium's capacity for spontaneity -- "the photography of its day," according to Mower -- to create documentary images. 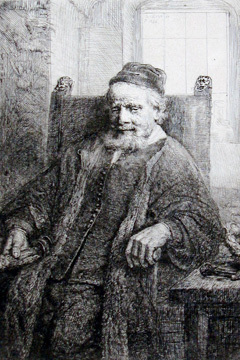 A portrait of goldsmith and print dealer Jan Lutma is one of 30 etchings by Rembrandt on view at the Hamilton Library beginning today. A self-portrait of the artist in a heavy fur hat. Unlike engraving, in which images are incised into a metal plate using sharp steel tools, etching allows the artist to draw directly through a thin film of acid-resistant resin on a plate. The image is bitten into the metal following an acid bath. 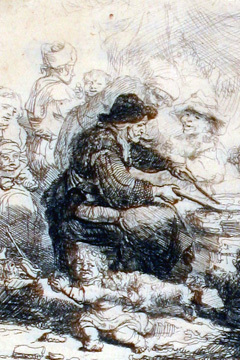 The quickness of the medium allowed Rembrandt to create documentary images, such as that of the pancake woman at left, that appealed to collectors.